I started this post almost a year ago, and it’s been languishing in my “Drafts” folder. I recreated this dish a week ago for one of Gabriel’s birthday dinners, and my father-in-law requested the recipe. I should note here that my FIL is a very good cook — we’re usually asking him for recipes, so it’s fun when the roles are reversed. It’s also a bit easier when we ask him for recipes, since he actually, ahem, uses recipes, as opposed to just making stuff up. 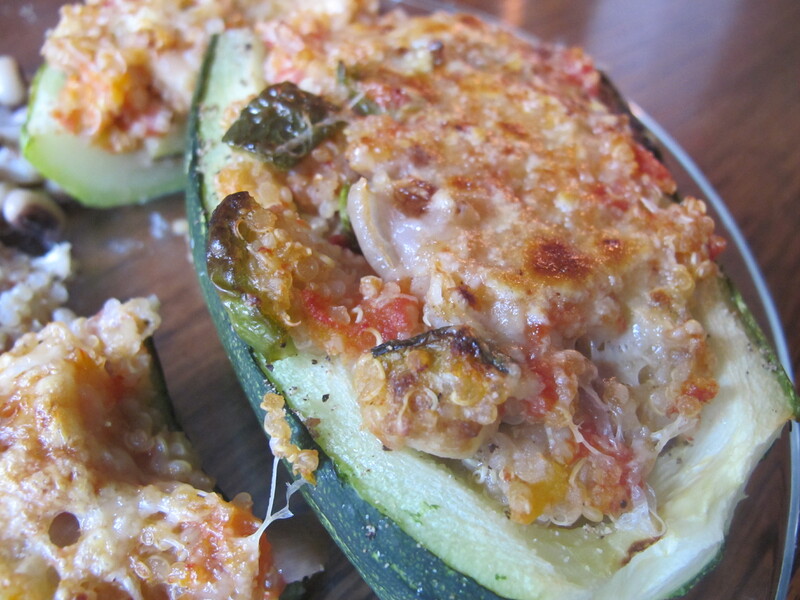 Stuffed zucchini is a great use for somewhat overgrown zucchini and other summer squash, but most recipes call for a long baking time. This recipe is not oven-free, as it requires a few minutes under the broiler, but it still probably uses less energy and heats the house up less than having the oven on for an hour. If you’re making a small batch, and have a toaster oven, you can really be efficient! This is one of those “use what you have/what you like” recipes. 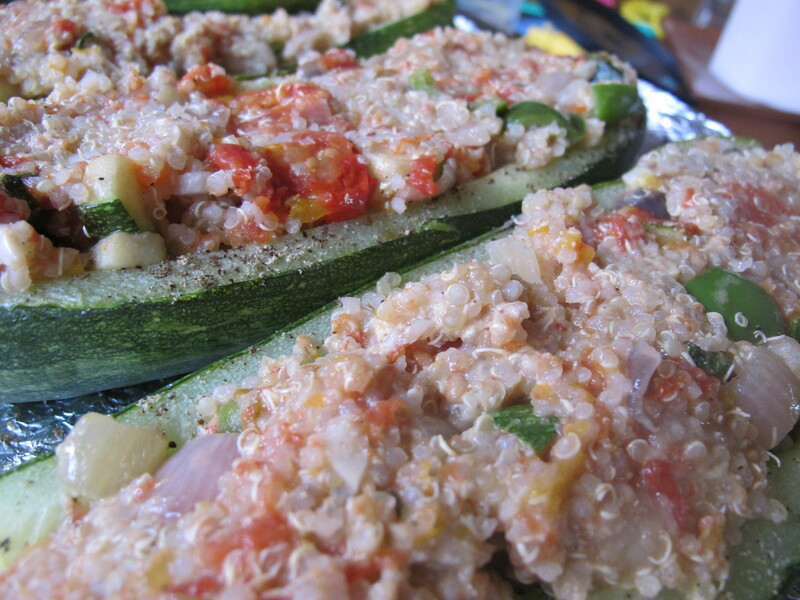 In the above photo, from last fall, I used quinoa as the grain, and we had tomatoes and peppers from the garden. Last week, I used brown rice, along with some tempeh to up the protein and flavor (lentils are another good vegetarian protein addition). We didn’t have tomatoes or peppers last week, so I used fennel, kale, and corn, plus some eggplant puree and fresh herbs, for the vegetables. There is a decent bit of prep work, but a lot of it can be done ahead of time, so it works well when you’re having guests for dinner, or if you just have time earlier in the day, but not in those last frantic minutes right before dinner. 1. Prep the squash: cut in half length-wise, and scoop out the seeds and goop in the middle. Sprinkle salt on the insides, and drain in a colander for 30 minutes. While the squash is draining, bring a large pot of water to a boil (large enough to fit the squash halves). After 30 minutes, parboil the squash for 5-7 minutes, until slightly tender. Drain well. Reserve water for next step (optional). 3. Prep the veggies: Since we’re not baking the stuffed zucc, you want everything fairly tender and ready to eat. Chop everything into bite-sized pieces. Sauté onions, then add other veggies to sauté. I used a mix of butter and olive oil, plus about 1/2 t. of salt. If you’re using tomatoes, you can just throw the chopped, uncooked tomatoes into the filling, or cook them down into more of a sauce. 6. Stuff it and broil it: arrange squash halves on a broiler pan or in a large cast iron pan. Sprinkle halves with salt and garlic powder. Add the stuffing. Preheat the broiler for a couple of minutes, then broil for 5 minutes. Remove, add cheese, and broil for an additional 2-3 minutes. Don’t worry if you have extra stuffing. Serve it on the side, or save it for leftovers. If you don’t want to heat the house up at all, I imagine you could do the “broil” step on the grill to good effect. While not required, adding something a little “saucy” can be nice. For my most recent batch, the eggplant puree (frozen from last summer) filled that role. Tomatoes or tomato sauce work similarly well. To prep ahead, complete steps 1-5. You could stuff the squash ahead of time, also, but it’s best done shortly before broiling. If your filling and squash are starting at refrigerator temperature, either get them out of the fridge about 30 minutes before dinner, or microwave the filling to warm it before completing step 6. This entry was posted in Food, Recipes and tagged eat local, vegetarian cooking. Bookmark the permalink. Yum! I look forward to trying this.